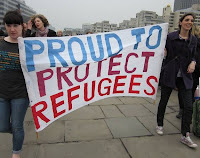 On 26 March up to half a million people gathered in London to protest swingeing government cuts, many of which will massively impact refugee and migrant services. See 'UK government takes axe to refugee and asylum services' for more details. Donna Covey, Chief Executive of the Refugee Council gave an inspiring speech at the rally in Hyde Park at the end of the march. Donna Covey speaks at March for the Alternative from Trades Union Congress on Vimeo.